Adonai is the crown of all the saints, come let us adore! You who pointed to the Savior Could not follow where He trod. Yet with tears a sinful woman Washed them of the journey’s mud. Worthy prophet, true Elijah, Come to witness to the Light. Brought to nothing by the madness of a drunken king at night! Jezabel has won her trophy, Not deceived this time by flight. You were sent no fiery chariot, But a martyr’s glory bright. Your desire was to diminish While you saw the Christ increase. When you heard the Bridegroom coming, then for joy your wisdom ceased. You who thundered once by Jordan Listened now in deepest peace. Amen. O God, are my refuge, the God who gives me life. My refuge, do not fail me. hear my cry and save me. a mighty stronghold to save me. to whom I can always turn. my trust throughout my youth. my strength from my mother’s womb. My hope has always been in you. but you keep me in your care. all day long I sing of your glory. they have designs on my life. run quickly , Adonai, to help me! wrapped, by their deeds, in shame. and never stop singing your praise. Adonai, you alone are just! But you, gird up your loins; stand up and tell them everything that I command you. Do not break down before them. And I for my part have made you today a fortified city, an iron pillar, and a bronze wall, against the whole land–against the kings of Judah, its princes, its priests, and the people of the land. They will fight against you; but they shall not prevail against you, for I am with you, says ADONAI, to deliver you. You sent your disciples to John, *and he gave witness to the truth. V. He was like a brightly shining light, *and he gave witness to the truth. V. Glory to the Abba and to the Word and to the Holy Breath of Love. I am not the Christ; I have been sent to prepare his way. ~help us to work for justice and thus open the way for Jesus. You called John the Baptist to live on a simple diet, and close to nature in the wilderness, ~help us to live more simply so that other people and species may flourish. You called John the Baptist to challenge those who misused power and disregarded the dignity of others ~help us to speak the truth to power with love. ~help all those who have entered the waters of Baptism to live out the faith and love they have professed. ~help us to recognize with humility and gratitude the special role each of us has in proclaiming and building your reign of justice and peace. ~ help us to imitate his witness to your truth and to the marvelous gift of your love. 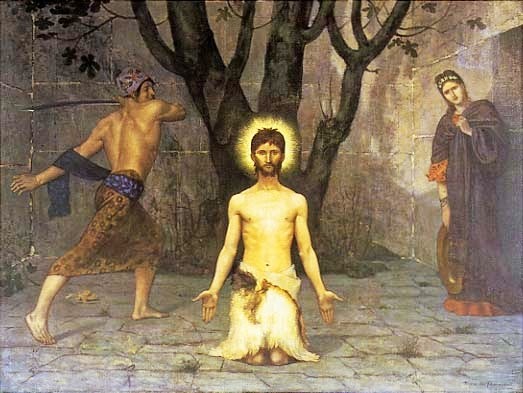 We bless and thank you, O Gracious God, for you raised up John the Baptist to prepare your people for the coming of Jesus, our Love. Give your people joy in spirit and guide all humanity into the ways of justice and on the paths to peace, for yours is the glory and power of love now and forever. Amen. May the tender compassion of our God bless + us and guide our feet in the ways of peace, ~Amen.